The media must play a proactive role in helping solve the country’s sanitation problems. Stakeholders in the sanitation sector, have identified partnership among the private sector, the government and the development partners as key to dealing with the challenges in the sector. 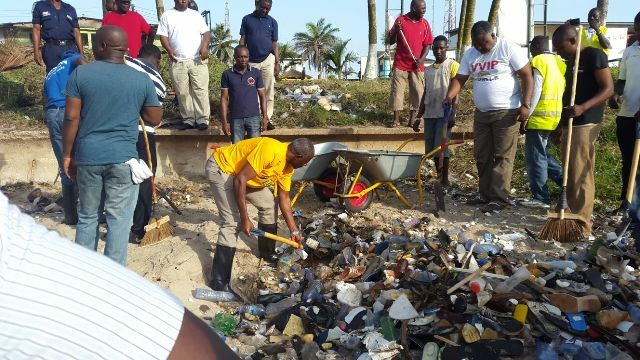 Alhaji Collins Dauda, Local Government and Rural Development Minister, the Central Regional Minister, Thomas Aquinas Quansah and Municipal Chief Executive, Mr I. K. Sam in action and Nana Kodwo Condua VI cleaning along the sea. At the maiden sanitation dialogue, there was consensus among stakeholders that cooperation was needed to enhance capacity, fund sanitation projects and programmes, and ensure behavioural change as well as enforce bye-laws and policies. The dialogue series are planned to raise awareness of sanitation issues and to get the donors, government and the private companies working together in the execution of projects. Speaking at the forum, Mr David Duncan, the Chief of Water, Sanitation and Hygiene at UNICEF, said areas, including capacity building, government prioritisation and decentralisation required urgent attention. He said the development partners had over the years committed various sums of money to the sector but only little progress had been made. Mr Duncan said challenges such limited harmonisation, low capacity, weak decentralised financial management, poor operation and maintenance, among others had combined to rob the sector of progress. To be able to do this effectively, Mr Ashiegbey said the media would need to abreast of the development in the sector, understand the issues and to communicate same to the public. The Executive Chairman of Zoomlion and President of the ESPA, Mr Joseph Siaw Agyepong said from humble beginnings the company had become a major player in the sanitation sector. He said with ongoing waste treatment projects, Lavender Hill, could be closed by end January. The projects include renovation works at the Mudor waste treatment plant in Accra and the Adjen Kotoku treatment plant. Mr Agyepong said access to finance and non-enforcement of existing bye-laws were among the major challenges facing the private sector and called for effective cooperation in managing the country’s sanitation situation. Minister of Local Government and Rural Development, Alhaji Collins Dauda, praised the private sector for the support to the sector over the years such increasing access to waste bins, waste recycling, composting, haulage of municipal waste and ensuring better management of final disposal sites and engineered landfills. Similarly, he commended the development partners for funding and technical support they continue to give to government to improve the sanitation situation.